Certification is the final point to consider when buying a diamond is the Certificate. A diamonds' certificate is like a fingerprint for that stone, and many people do not realise how important the certificate for the diamond is, or exactly what information is found on one. A good certificate should include the date of analysis, the carat weight, cut, clarity and colour as well as the proportions of each section of the stone. A certificate does not detail monetary value, however it acts as a guideline for how much the stone is worth and thus how much it should be insured for. A good certificate will be able to identify any diamond so you can be sure of what you are paying for. Now this may all seem a little abstract, but what if you lose the ring, or it gets stolen? The cost of replacing it could be an expense you just cannot manage. A genuine certificate could mean the difference between getting the full reimbursement from your insurers or getting very little compared to what it was originally worth. 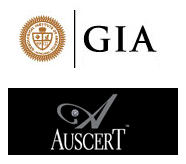 There are several different certifying bodies, the most common one is the GIA , which stands for the Gemological Institute of America and is one of the biggest Gemological associations in the world. - Australian based Scientific Gem Testing Laboratories (SGTL) which creates the AUSCERT diamond certificates.